Boat Haven yard rates in Port Townsend have been in question for the last year. Due to a collaborative effort between the Marine Trades of Port Townsend and the Port of Port Townsend, NEW winter rates have been posted. 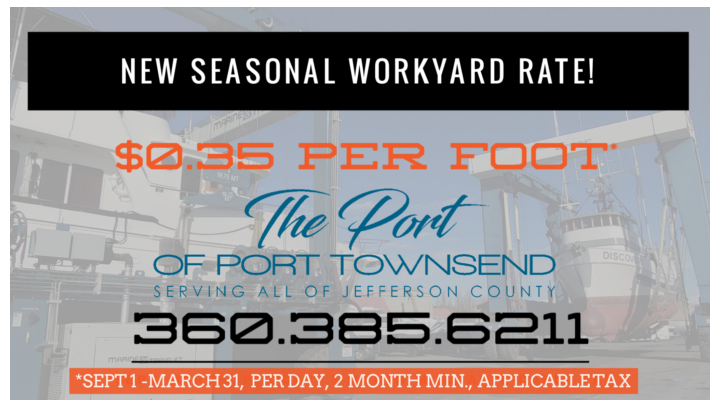 While every yard has its own formula for presenting the numbers, the port has accepted the recommendations of a tenant task force that methodically studied comparable yards in the region to come up with this pricing schedule. Please help make this effort a success while you take advantage of one of the very best marine trades collectives on the west coast, a beautiful town with wonderful people, and a location near some of the most amazing parks and recreation in the US. See the Port Townsend Marine Trades Association service directory. the PORT of PT for a yard quote. I want to thank those of you who took the time to answer my brief survey regarding your priorities when choosing a haul out yard.